Widely distributed throughout Europe but scattered and not always consistently present in some areas. Found throughout the UK in suitable habitats, numbers increase in winter due to visitors from Northern Europe. The Crossbill is only found in mature coniferous woodland particularly Spruce and Pine. The Crossbill has evolved to feed exclusively on conifer seeds, it's specialised bill enabling it to extract seeds from pine cones. Due to it's dry diet it is a frequent visitor to water sources near it's food source. 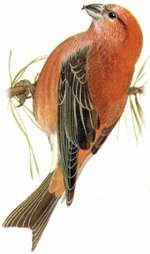 The Crossbill male has a dull red body, dark wings and a distinctive hooked and crossed bill. The female has a dull green body. Note the distinctive dark eye, crossed bill and overall reddish colour of this male bird. The Crossbill is rarely seen away from mature pine trees and is unlikely to be confused with other species although there are three other species of Crossbill which can be difficult to separate, see note below. The female Crossbill has a dull green-yellow coloured body, the wings and tail, like the male are dark and of course she also has the hooked and crossed bill. Whilst most often described as green, the female Crossbill can appear yellow in certain light conditions, especially the birds breast and rump. Note the birds distinctive dark eye in this image. Juvenile birds are mostly brown with bold streaking on the underside, the young birds bill only becomes crossed as it gets older so cannot be relied on to confirm identification, however young birds are inevitably accompanied by adult birds in small flocks and if not seen can often be heard calling. A rare visitor to Western Europe, usually from Canada or Alaska. As the name suggests the bird usually has two whitish wing bars which can be prominent or faint. However as the Common Crossbill has also been known to have faint wing bars this cannot be relied upon to confirm identification. * Usually has two whitish wing bars. 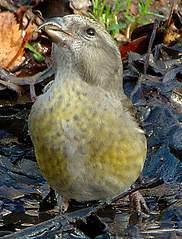 * Is smaller and slimmer than other Crossbills. * Longer tail than other Crossbills. * Smaller slimmer bill than other Crossbills. * Has a distinctive call. Very hard to distinguish from the Common Crossbill, once considered the same bird, then a sub-species it is now treated as a separate bird. It is the only British bird to breed only in the UK and nowhere else in the world. There are around 7000 breeding pair in Scotland. * Found only in Scottish highland pine forests. * Larger heavier bill than Common. * Same plumage and call as Common. Note the heavier much deeper bill of this Scottish Crossbill. A rare breeding visitor to the UK. With around only 70 pair breeding mostly in the same areas as the Scottish Crossbill making ID even more difficult. This images illustrates the parrot like appearance of the bird due to it's thick neck, oversize bill and large head. * Heavier bill than Scottish Crossbill but shorter. * Larger head with Parrot like appearance. * Around 30% bigger than the Common. * Thicker neck than other Crossbills. * Softer, shorter, slower call than the Common. Note the clear white wing bars.